If the Bed Pattern really is the Tree of Life, I knew there were still more lights that I hadn’t found. I also knew immediately that the entire pattern had to be around everyone’s bed. The lights I hadn’t been finding obviously would have dowsed as detrimental and I was looking only for beneficial energies. I jumped up, got out my dowsing rods, and dowsed around my bed. Sure enough, I found two more pairs of lights. One pair was along the sides of the bed, parallel to each other. The other pair angled to intersect even farther beyond the foot of the bed, parallel with the other angled lights. The complete pattern has seven pairs of lights. Again, I hadn’t found them before because of the way I walked around the beds as I was dowsing. The lights are so close together, it was hard to distinguish one from the other. Each Sefirah represents a different attribute of God within mankind. 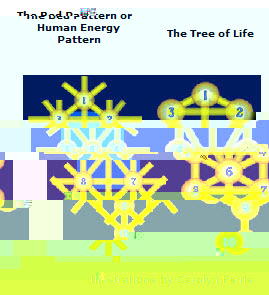 In comparing the complete Bed Pattern with the Tree of Life, one major difference between the two patterns is obvious–the location of the sixth sefirah in the middle. According to kabbalistic teachings, when God gave Moses the Ten Commandments at Mount Sinai, the Creator also gave Moses the entire written Torah, the first five books in the Old Testament. Not only did Moses receive the written Torah, he also received the oral Torah–the Kabbalah. The Kabbalah reveals the real meaning behind the written Torah, which is in code. According to legend, Moses taught the oral Torah to the leaders of the Twelve Tribes of Israel. This was passed down orally from teacher to student for thousands of years until it was finally put in writing by several kabbalistic masters in the last few hundred years. There is no single written work called Kabbalah; rather it is a collection of writings from these sages. Kabbalah is the essence of Jewish mysticism, and the Tree of Life is the central feature of Kabbalah. Sefirah, or sphere of energy, at the top of the Tree of Life. The single Light then divided into two lights, masculine and feminine, and entered two more vessels, illustrated by the spheres numbered 2 and 3. These vessels couldn’t hold all of the Light and they shattered, creating an array of vessels in the pattern of the Tree of Life. So before anything was created in the Universe, this pattern of lights was put into place by the Creator.